The MXL Genesis Tube Condenser Microphone delivers a professional solution for home studio, project studio and professional studio recording. The Mullard 12AT7 tube and large diaphragm cardioid capsule deliver the warmth, smooth highs and tight low-end associated with higher priced tube microphones. A -10dB Pad switch is provided for maximizing headroom and minimizing distortion when capturing excessive transients (peaks). A low-frequency roll-off switch minimizes low-end noise such as hum, wind or proximity effect. The Genesis features a cardioid polar pattern that effectively minimizes noise and off-axis feedback. Its wide frequency response and warm audio reproduction add character to both vocal and instruments alike. A dedicated power supply and cable is included. The Genesis features the Mullard 12AT7 tube (or equivalent) for warm, signal reproduction with smooth highs and tight low-end response. A -10dB pad switch is provided for maximizing headroom and minimizing distortion when capturing excessive transients (peaks). A low-frequency roll-off switch minimizes low-end noise such as hum, wind or proximity effect. The cardioid capsule minimizes off-axis noise and feedback. The tube requires a dedicated powers supply. The power supply and cable are both included. Box Dimensions (LxWxH) 14.5 x 11.8 x 5.4"
Genesis Large Diaphragm Tube Condenser Microphone is rated 5.0 out of 5 by 1. Rated 5 out of 5 by RuffNick from MXL Genesis Hands Down This is really a decent mic with very low noise and clear sound. 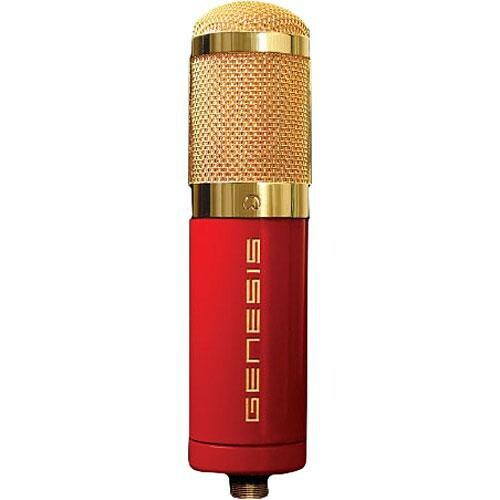 Genesis is a world renown Neumann U47 clone with hand selected Mullard tube. All cables are included and they are all Mogami Neglex. Soft mount and a big Shock Mount included too. You dont have to buy anything else just a Mxl Genesis and a decent preamp is enough for good quality recording.